Finally, my muse whispered in my ear to write this little post! 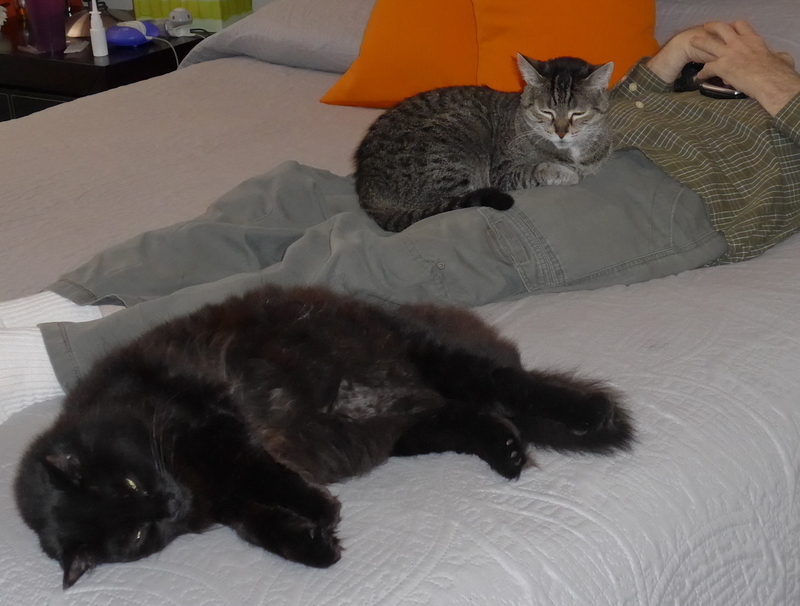 I live in a house with two cats and M. They are with him morning, noon and night. The black cat, Blackie, and the little cat, Purr, often vie for his attention. At night, one or both are in the bed. Blackie will be by him until Purr wants in the room so then she moves to the foot of the bed and Purr curls up at his side. Purr came to live in the house when we moved. She lived outside and every day M. fed her on our front steps. Blackie, then and more now did not take well to Purrs. Blackie has always preferred that she and M were the only ones around M. The addition of Purrs to the inside of the house has caused Blackie to feel like the wife scorned. I am sure that there are many that may feel as she does. Now, nine months later the rivalry continues, although now they tolerate being near of each other! Nothing ever is for certain with them. M and I have agreed that they speak to each other and set new rules that often mystify us in their actions. During the day you will find Blackie sprawled across M’s desk on top of bills and other paperwork. While she is there he does little work. Purrs will sit on the banister watching them. The evening news signals both cats that M. will be in his lazy boy chair. Purrs will immediately jump on his lap and watch him eat his salad. I have gotten used to bringing him his dinner plate so that Purr is not disturbed. She will sleep soundly in his lap till he decides to go to bed! Blackie will perch herself on the glass coffee table or in the dining room. She is always close enough to see what will happen. Unfortunately, Blackie and I are equally fat making us a little clumsy. This morning she missed the top of the glass coffee table and a loud clunk on glass rebounded into the kitchen. Then, she tried the jump again and made it. So you ask, where am I in this picture: They tolerate me. Purr is much friendlier and trusting than Blackie so I can touch her without M. being there. If he is close to Blackie then I can sometimes pet her. I am way past the stage of finding furry animals wonderful in the house. I am the one who vacuums up the fur balls, I am the one to remove stains from the carpets when Purrs chucks up food. And, now I must fill gouges in the banister with wood filler, sand and then paint it because both loved it as a scratching post. While they follow M where ever he goes they never follow me. God does love me since I prefer the solitude of my third floor studio/sans pets. Let the three of them enjoy each other. I am quite happy not to join the crowd! Yes, two cats and a man. What am I to do?? Next Next post: Remembering Chicken! Have you considered a dog? At my house, the dog owns the cat. I can live here as long add I buy food, otherwise, I would have to move out. I Ann so glad I found your blog! Love you, Frank.